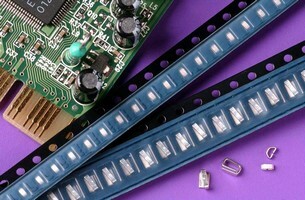 Test Points suit high-density printed circuit boards. RoHS-compliant, surface-mount Series TP-108 features 0.070 x 0.135 in. pad size and 0.060 in. profile. Test points are manufactured using 0.010 x 0.040 in. phosphor bronze No. 510 spring-tempered flat wire alloy and 100% matte tin over nickel underplate for reflow solderability. Equally suitable for automatic or manual test, units accurately identify faults, both during and after manufacture. They are rated to 2 A and operate from -55 to +125Â°C. Miniature and Compact, Test Points Simplify Safe and Reliable Testing on High-Density Circuit Boards Denville, NJ, August 24, 2005...Components Corp., a world leader in the design and manufacture of circuit board hardware technology, today announced the availability of the 100% RoHS-compliant TP-108 Series of ultra-low profile test points. Offered to satisfy the space conservation requirements of high-density PCBs, especially those engineered for mounting high pin count packages, the surface mount devices boast a 0.060" profile, and a 0.070" x 0.135" pad size. The TP-108 is notably constructed utilizing a proprietary technology developed expressly to yield long life and unrivaled durability. The technology includes the utilization of flat wire to facilitate a larger area for mounting the device to the board. This bigger area is a significant benefit as it helps minimize mechanical stress on the devices' connections to the solder pad to enhance the durability and reliability of the connection for miniature probes, clips and j-hooks. Moreover, the test points' loop configuration holds these devices securely, and eliminates the potential for slippage and puncture wounds frequently associated with posts and turrets. Components Corp's newest RoHS-compliant test point series is ideal for employment by fabricators of SMT printed circuit boards challenged by testing smaller, high-performance boards with greater functionality. Equally suitable for automatic or manual test, TP-108s offer the ability to easily and accurately identify faults both during and after manufacture. They may be confidently specified for use in a wide array of applications ranging from consumer electronics, to medical and aerospace. The test points are manufactured using a 0.010" x 0.040" phosphor bronze #510 spring-tempered flat wire alloy, and a 100% matte tin (0.0001 min.) over nickel (0.0001) underplate for reliable reflow solderability. They further feature a current rating of 2 A, and an operating temperature range of -55 to +125 degrees C. Designed for automatic placement by standard pick-and-place equipment, parts are supplied on 8 mm wide, 4 mm pitch, conductive polycarbonate tape that meets ANSI/EIA-481 standards. Test points are offered on 7" reels/1,000 pieces, or 13" reels/5,000 or 8,000 pieces. For more detailed specifications visit componentscorp.com/details/tp108.html. Pricing for Components Corporation's TP-108 Series of ultra-low profile, RoHS-compliant test points is $0.080 ea., in quantities of 1,000. Delivery is from stock to 4 weeks. Samples are available upon request. About Components Corporation For over 60 years, Denville, NJ-headquartered Components Corp. (www.componentscorp.com) has been a global leader is the design, engineering and manufacturing of precision printed circuit card edge connector, printed circuit test points, preform jumpers and hardware, and battery contacts. The Company remains committed to solving the industry's most demanding interconnect and testing challenges with high-quality and innovative products for the broadest range of mission-critical applications. It's leading industrial, military, commercial and consumer customer base have come to rely on Component Corporation's in-house tooling capability to ensure the excellence and economy of products regardless of the quantity required. The Company's products are marketed through a worldwide network of sales representatives and distributors (http://componentscorp.com/html/search.asp.). Test Points mount on single, .014 dia. PCB hole. Test Points come in 10 colors.